Are you REALLY gonna eat that?? Well, yes, as a matter of fact I am! And I have to tell you, it smelled so good baking I was just about ready to gnaw off an arm before it was done. If it wasn’t for the fact that it’s for company coming tonight (it’s my turn to host my quilt guild), I would have had at it already. There is almost a pound of chocolate in this beast. Doesn’t it just look dreadfully delicious? The recipe is called Mississippi Chocolate and Coffee Cake. 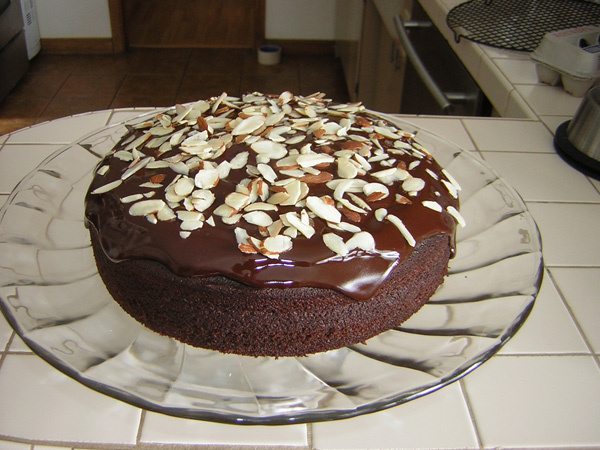 The other night, just as I was trying to figure out what to make, I got one of my weekly e-mails from Cooking.com with a bunch of Mississippi mud cake recipes, and this one was pictured. I had everything I needed to make it, and we all love chocolate more than our luggage, so here we go. I’ll let you know how it tasted just as soon as I recover from the cocoa coma it’s bound to put me in. Update: Just so you all know, it was every bit as good as it looked, and then some!